Chris Taylor: So, you’ve heard a little bit about what we’ve done, a little bit about the pollutants in the atmosphere, about the effects of increased traffic and even, counter-intuitively, how the tunnel is likely to attract even more traffic, and now we’re going to talk about the campaigning aspect, and how we can start to move things forward for ourselves. I’d like to introduce Siân Berry. 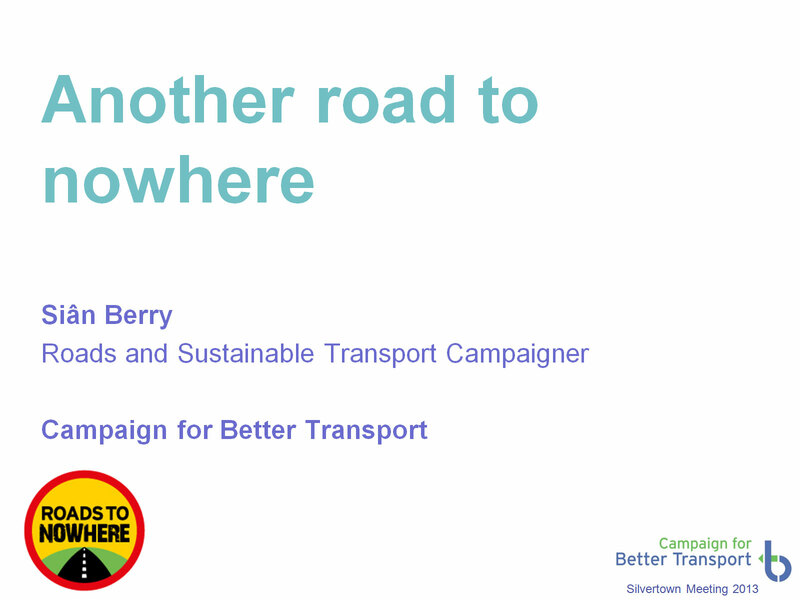 Siân’s a sustainable transport campaigner at the Campaign for Better Transport and has been running the campaign ‘Roads to Nowhere’. She was also the Green candidate for Mayor, previously, and has been successful in contributing to defeating the previous Thames Gateway project. So over to you, Siân, thank you. Simon [Birkett] talks about there being powerful laws against breaches of air quality limits, and there really, really are. We know that at a national level, the government is getting very very worried about some of its road building plans being challenged by people who have found places that are just below the limits that are going to be pushed over the limits by new road building plans. I spent most of this morning talking to local radio and papers and TV in the east of England, because the A14 scheme, which aims to put a giant new road between Cambridge and Huntingdon will deliver traffic directly into two Air Quality Management Areas (LAQM) that are hovering on the border. Nothing like the figures that you already have here in London, but the government and the Highways Agency are worried about the challenge that we’re putting up to that road, because of these very strong laws on air quality. So I think the things we’ve seen here today: the awful air quality you already live in, the fact that this road will put loads more traffic into your area – just dump it into this existing soup of air pollution – is a really strong aspect of what can campaign on. I’m here partly because my organisation – and when it was called Transport 2000 – was involved in the campaign against the Thames Gateway Bridge. This was proposed for the Gallions Reach site – as John said – since the Dark Ages! But the last time was in the early 2000s, mid 2000s. I’ve been going through our files in the office this, and I’ve got a document that dated back to 2002 on our computers, so presumably we had some before we had computers as well. And that was absolutely decisive. I heard from Jenny Bates here from Friends of the Earth, who was involved in that, earlier on, that the barristers and QCs on the other side, the barristers working for TfL, were actually very pleased to have people on the other side who were equally knowledgeable and equally able to argue. The inspector himself – I’m assuming it was a man – said that it was helpful to receive the evidence of the expert witnesses, and that it was novel to see that it came from funds for the promoters. So all of those expert witnesses managed to pick the biggest holes ever in the case for the Thames Gateway Bridge. 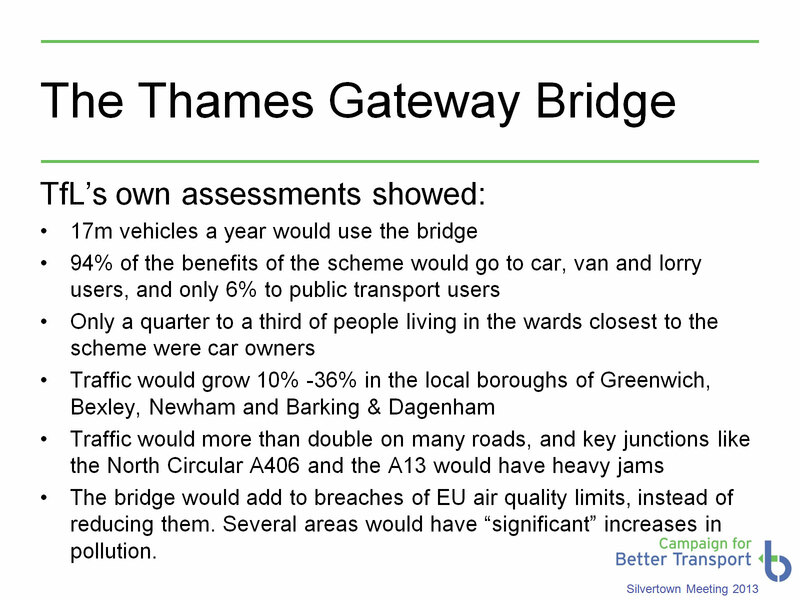 So just going back to the previous slide, these were some of the factors concerning the bridge that were actually given within TfL’s own documents. 94% of the benefits would go to car drivers, and only 6% to public transport users. This is despite the fact that, in the areas that were supposed to be regenerated and helped by the scheme – which is what they were claiming – only a quarter to a third of them were car owners. It would increase traffic across a very wide area, lots of boroughs would be affected by extra traffic. Traffic would more than double – as John [Elliot]’s studies show. On many roads, the next junction along would just jam up. 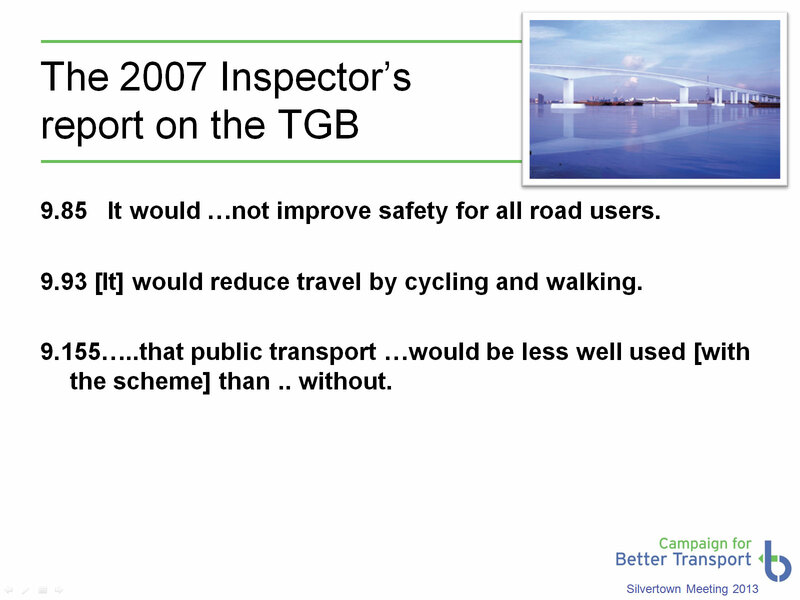 So we’ve got the same type of thing going on, and that’s just in terms of TfL’s own assessments. 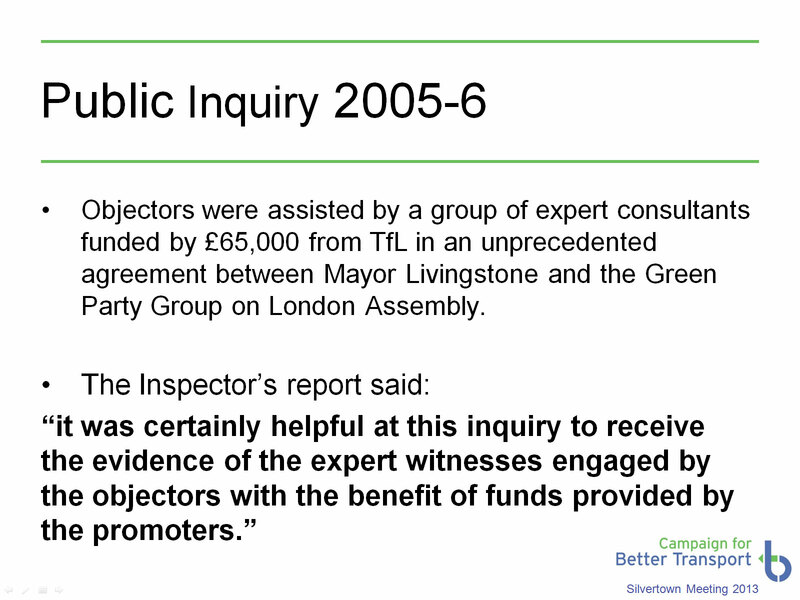 The objectors gave evidence for about a year, I think, between 2005 and 2006. 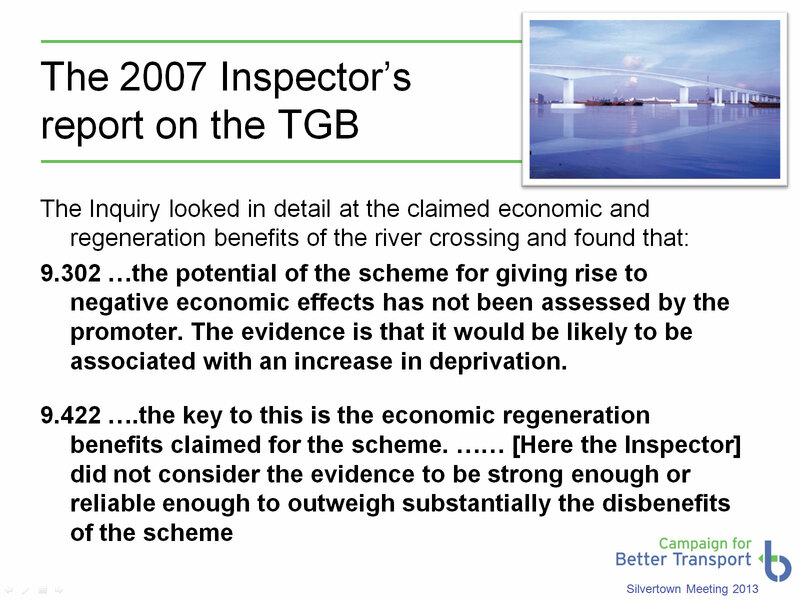 And eventually in 2007 the inspector wrote his report and they got to see what he thought. And according to my summaries that I’ve got from the campaigners that were working on it at the time, he roundly condemned the scheme. And there’s lots of really good quotes in his report. We’ve produced a summary of the best bits. But there’s some brilliant examples of exactly the things that we’ve been talking about: the road would cause increased congestion, there’d be loads more traffic, the benefits are not used to relieve the problems you currently have, it would encourage people to make longer journeys, there’s more trips generated by the scheme, it wouldn’t improve safety, it would reduce travel by cycling and walking, public transport would be less well used with the scheme than without it. And those are trends that are just completely alien to London in the last twenty years. The Thames Gateway Bridge would have set things backwards. Air quality, well, it was an important issue there, but it’s more important now; we have stronger laws, we have more people campaigning on air quality. But even at the time, he drew this point to the Secretary of State’s attention, that air quality would be worse. And we know more now than we did then about the effects of air quality and air pollution, so again, then it was a decisive thing. There were a lot of economic benefits claimed at the time – you always get this, and we’re going to get it again on the Silvertown tunnel: the city needs growth and therefore needs more traffic. This was thoroughly examined during the enquiry. It’s difficult to make a case against because often they don’t give concrete reasons to back up the case they’re making for. But in the end, the inspector didn’t consider their case to be strong enough or reliable enough to outweigh the disbenefits of the scheme. So even on their own terms, even if you strongly believe that new traffic would create growth, it just doesn’t work out – the inspector thought that was not a good reason. So basically, what happened then? Five thousand people objected to the scheme as a result of the various campaigners who were funded and who were working long before they were funded, in fact, to raise awareness of the thing. 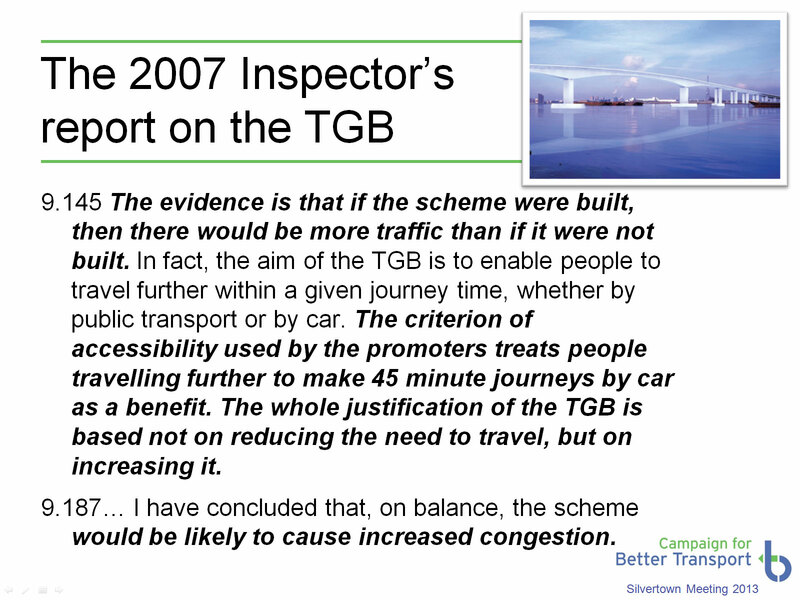 The inspector’s report kind of sat on the shelf for a little while, if I’m not mistaken, and the Secretary of State, TfL wondered what to do about this fact. Eventually the government announced it was going to re-open the enquiry, but then the election intervened – in which I was involved, I was the Green candidate. I didn’t have to think very hard about this, about what was my policy – my policy was to cancel the Thames Gateway Bridge. 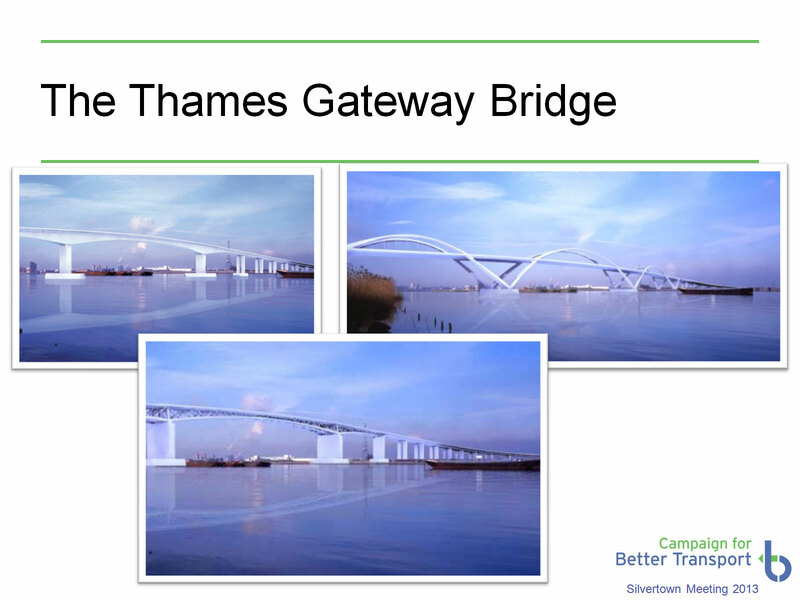 Boris’s policy was to cancel the Thames Gateway Bridge as well, thanks to heavy lobbying from campaigners so when the election happened in May 2008, he did cancel it. But before that, while they were waiting for the inspector’s report, campaigners also managed to get funds together to commission a set of consultants to look at alternatives. And that’s well worth a look at because these are alternatives that mostly haven’t happened since 2008 and are really good things to promote. When you’re going through a consultation, promoting alternatives, trying to ensure that TfL has looked at those alternatives properly can be really decisive in going through the planning process, so I’d highly recommend having a look at it. It did some calculations on benefits and different things, and it did come up with a cable car. Now those of you who complain about the current cable car – it was looking at the actual location of Gallions Reach, as a place that arguably could do with more crossings to get people across, not cars, and that was what was proposed. The one that’s there now is possibly not in the right place – in the middle of a crash zone – and hardly anyone uses it, so don’t blame my colleagues and the consultants for that! 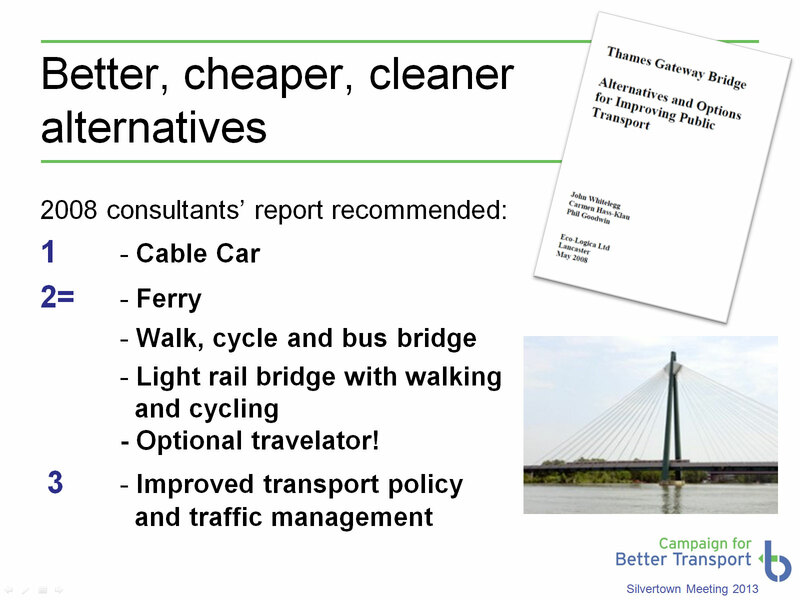 They compared it to a large road scheme, and above the road scheme came all these other sustainable transport options. A ferry, a bridge for walking, cycling and buses: the picture at the bottom there is of a bridge that does this in Vienna, crossing about the same amount of river, and it started off as a bus-only, walking and cycling, and I think you can see on it, just about there, there’s actually been a metro line extension put on it. So it’s provided really good links much much cheaper than a road bridge because of the different weights and things. They also proposed the same thing, a light rail bridge, with walking and cycling alongside, and because it’s quite a long way, they also assessed the costs and benefits of a travelator across the bridge. So I think we’d all prefer to have a nice walking, cycling and travelator bridge against a new tunnel or a new bridge at that point. And third, ahead of building anything at all, was improve transport policies, better public transport in general and traffic management. So the demand management measures that John talked about earlier: park and ride, congestion charge, that sort of thing, are all far better value and far more effective than building new roads. So hopefully that cheers you up a bit that this thing can be defeated. It has to go through quite a few more stages of planning. It’s been designated a Nationally Significant Infrastructure Project. You get a sort of halfway house with that, you don’t get a full public enquiry. There won’t necessarily be that courtroom yearlong thing. The Nationally Significant Infrastructure planning process is supposed to be finished within six months, but before it starts, the idea is that the promoter has to get out of the way all the consultation, and do the consultation really properly. The local councils get to sign off that the consultation’s been done properly, local people get to campaign and raise awareness and get their objections in early. You can do quite a lot of back-and-forth challenging them for their business cases and things beforehand. If they don’t do all of that, and haven’t done the consultation properly, the examiners are trained to treat that as a bad thing. I’ve been through a couple of road things under this new process – it is quite new. The first examination last year was quite shoddily done, and it was given approval – it was the Heysham M6 Link up in Lancashire – and we did take it to the High Court to object to the processes that went through, and the High Court did rule that it was pretty inadequate, the way they’d done it, but wasn’t prepared to go as far as overturning the approval. But some of the comments about how improperly it was done were very useful. The next one that’s going through the same process is in George Osborne’s constituency, in Cheshire, it’s called the A556. For that we’ve identified exactly the air quality problem, with the air quality being slightly below and going slightly above. Their own assessment of it accepts this, it says ‘we must acknowledge that this potential breach is occurring’ so we’ve raised that very strongly with the inspector there, so we’ll see how we do with that, it’s kind of a test case. You have the very strongest case for raising these issues here I think. To cheer us all up, here’s a picture of all the campaigners – this is more or less the same panel from a meeting at City Hall a couple of weeks ago: we’ve got Simon [Birkett], Ian [Mudway], John [Elliott], Jenny Bates from Friends of the Earth, Darren Johnson of the Greens, and Alan [Haughton] from the Stop City Airport campaign, we’ve got the Network for Clean Air, Friends of the Earth: fantastic experience with exactly this area. Also, we have other experts on hand – there’s Campaign for Better Transport – as I said, I’m here to help with campaigning. 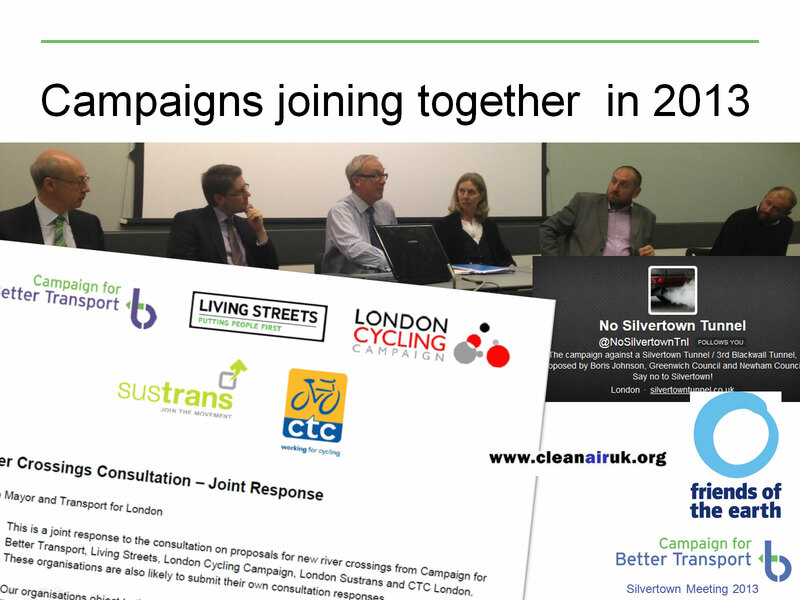 And all these organisations – these national and London transport organisations – joined us in a joint response to last year’s consultation, and we’re all firmly against it as well, and will be helping to campaign against it. So I think with the ideas we’ve got, with the laws that there are, with the resources that we can get together – I mean, we’re not going to be given £50,000 by Boris, but we can raise money through grant organisations, through fund-raising – and I think we can get a comparable set of experts together to challenge this and beat it again. 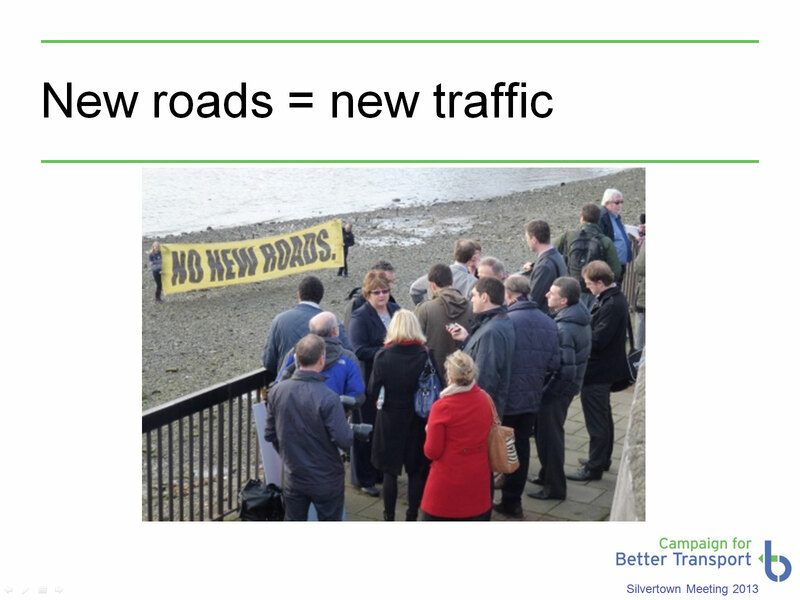 This is: “New roads equal new traffic” you must always remember that – it doesn’t equal […] it just equals new traffic. And this is Alan and me crashing the launch of the Bridge the Gap campaign with a giant banner, so we can handle things like that as well! 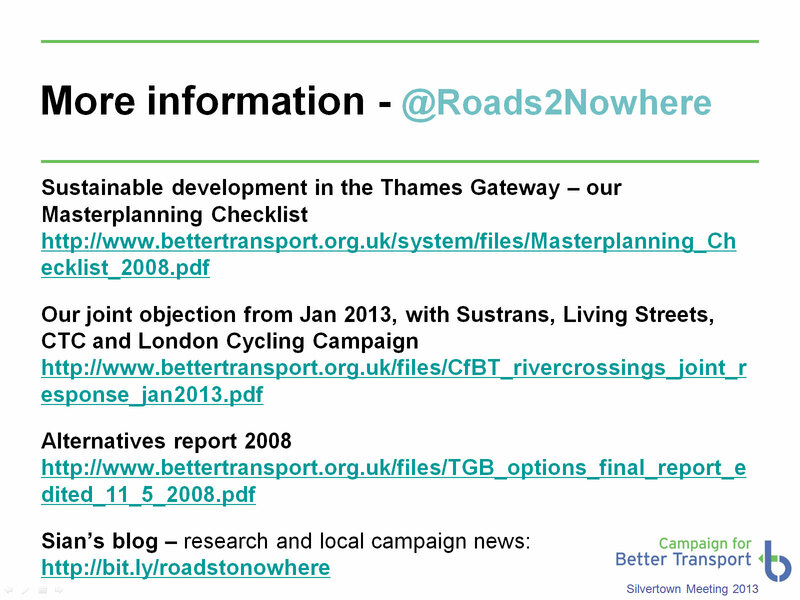 I’m @Roads2Nowhere – I’ve been tweeting from that account this evening – there’s links to documents there that I’ve recommended. So I hope you’ll be interested to check it out, that you’ll follow the campaign, that you’ll make sure you join in with our events, and if we all work together we can I think defeat this one, because it’s one of the worst ideas I’ve ever seen. Thank you very much!. “No to Silvertown Tunnel” would like to thank Siân Berry for taking the time to come to Greenwich and discuss some of the issues around new river crossings with us. Subsequent posts will feature the remainder of the meeting and presentations from Andrew Wood, along with the public Q&A session. 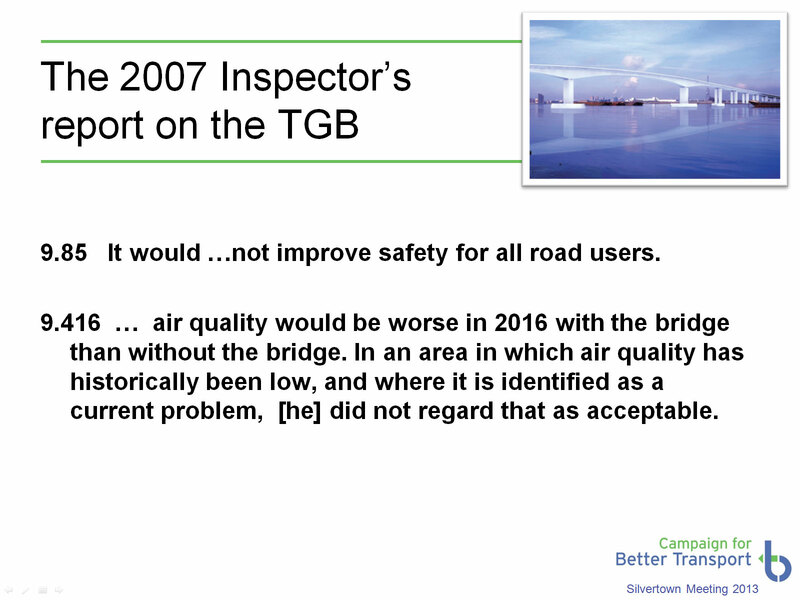 This entry was posted in News and tagged campaign, campaign for better transport, chris taylor, east london river crossing, oppose, roads to nowhere, Siân Berry, silvertown, thames gateway bridge on November 9, 2013 by Nikki Coates.